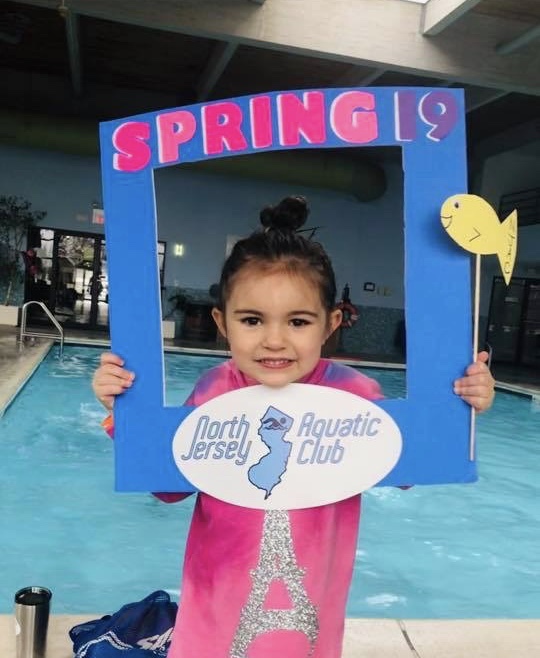 Welcome to North Jersey Aquatics! We are so excited to have your children swimming with our program this season. Spring session is an important one…it will get your child comfortable in the water in time for the Summer season! Here are a few things to know to help make those first lessons run smoothly, and to help ensure that everyone has an awesome first experience with our program! Arrive 10 minutes prior to your lesson. Give your self enough time to get changed and be ready to go right when your lesson begins! 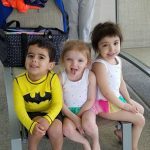 Have your child ready in their suit when arriving at the pool if possible. If you are changing your child at the pool, please do in the bathroom or locker room, as changing on the pool decks is not allowed. If your swimmer is accustomed to wearing goggles your swimmer is welcome to bring them. Here are some goggles that we recommend for our swimmers! If you swimmer needs a Flotation Device, one will be provided for them, no need to bring one! Swim diapers for babies and toddlers are required. Your swimmer will not be allowed to swim if they come without a swim diaper and diaper cover. If your child is not potty trained OR newly potty trained, they must wear a disposable swim diaper AND a plastic diaper cover with elastic around the legs and waist. IF YOU ARE NOT 100% SURE THAT YOUR CHILD IS TRAINED, OR IF YOUR CHILD HAS BEEN TRAINED FOR 4 MONTHS OR LESS, BE SAFE AND HAVE THEM WEAR A DIAPER AND COVER! Here are the diaper covers that we recommend. In the event of bad weather or pool emergencies, cancellation updates will be emailed and texted to registered participants. Please be aware that NJAC does not necessarily follow any particular district for school closings. In the event that we need to cancel a class, we will notify you at least TWO hours prior to class time when possible, but it is possible for cancellations to be last minute due to emergency pool closures or weather. PLEASE OPT IN to text messages in your portal page, we are unable to do this for you! Please join our North Jersey Aquatics Members page on Facebook. We will have updated information regarding our programs, events, cancellations, etc. posted here! We also run some awesome giveaways that you do not want to miss! If you know that your swimmer will be missing from a class, let us know by filling in our Report an absence form or in our NJAC app. We offer one EXTRA class built into each session! Your last week of class is considered your free makeup, and is built in to your package. If you have attended all lessons, you get this one as an additional class for free. After the 2nd absence, we will do our best to schedule makeups in openings we have that are the correct level. To be fair to all swimmers, we will accommodate up to two makeups in addition to your free built in class. Family swim is a great way to have fun as a family and see all the great things your child is learning in the water. There is always a lifeguard/instructor for family swim. However, children at a swim level of parent/child, transition, 1 or 2 must have a parent in the pool with them as well. Children at a swim level of 3 or higher must have a parent on the pool deck at all times but ALL parents are welcome to join in the fun. You must hold your spot for Family Swim by signing up in our customer portal. This can be done ANY time before Family Swim actually starts. Check out our calendar of events for all of the upcoming Family Swim sessions. NJAC Ambassadors will be on the pool deck a few times a session dressed in NJAC gear to help answer any questions. If you would like your child pushed more, or have any comments/concerns about your class or instructor, tell your ambassador! Our ambassadors are also NJAC instructors and are extremely knowledgeable about our curriculum and how our program runs. They are the direct link between our pools and our office team. Download the NJAC app in the App Store or on Google Play to see class times, report an absence, and view additional program information. And, as always, please know we are here to help! If you have a question, or a concern, please do not hesitate to contact us at any time. Thank you for being a part of the NJAC family!